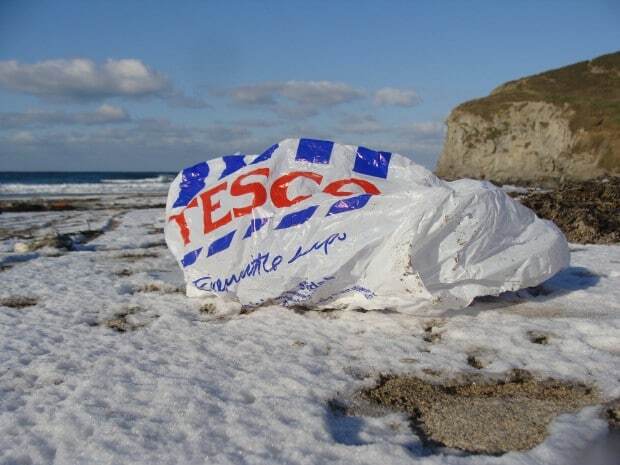 An unbelievable 19 million single-use carrier bags are given out daily in England and as shoppers hit the stores for their post-Christmas bargains, that figure could be even higher in the first few days of 2014, says the Break the Bag Habit campaign. On 1st October 2015, the Government will introduce a 5p charge on single-use carrier bags in England. However, in the 638 days until then, we will shockingly use more than a 12 billion bags, most of which will end up as litter or in landfill! Just by making a small change in your shopping habits by using re-usable bags from today onwards will help prevent this huge amount of waste and litter, over 12 billion bags, and the danger it poses to wildlife and our wild spaces. It will also help to reduce the wasteful annual £1 billion cost of tackling litter nationwide. Worryingly, even when the charge does come into force, there’s a danger its impact could be diluted if the Government’s proposal to exclude paper and biodegradable bags goes ahead. Smaller retailers might also be excluded, preventing them from benefiting from the reduced costs and stronger links with the community that their counterparts in Wales enjoy. So, this new year, join Surfers Against Sewage and say NO to the 19 million bags we’re offered at the checkout every day! Join Surfers Against Sewage and say NO to the 19 million bags we’re offered at the checkout every day! Giving out 19 million bags every day in England is obscene and unnecessary. Similar bag charges are already working in Wales and Northern Ireland, dramatically reducing the number of single-use bags distributed and receiving strong support from communities. But with the prospect of 638 days before the charge comes in for England, we should all take action and start saying no to carrier bags from today. « Thanks for your support in 2013!